The U.S. Fish and Wildlife Service announced Wednesday that the dwindling population of woodland caribou living in the mountains of northern Idaho, northeastern Washington and southern British Columbia need continued federal protection as a threatened species. Fewer than 100 of the caribou remain in the area; according to one estimate, there are just 27. In 2012, amid much controversy about just how far the government should go to protect the caribou, Bonner County enlisted the help of a California-based nonprofit to petition for removing the small group of caribou from the Endangered Species List. The effort was driven by snowmobilers and others in North Idaho who argued the protection of public and private lands for the caribou has hurting business and creating an unfair burden on the area's private land owners. 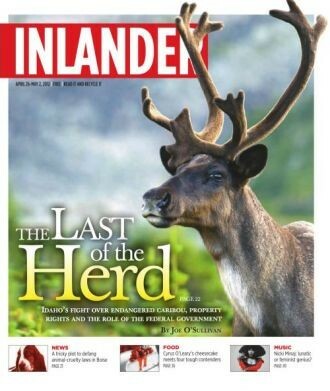 The Inlander published a cover story about this issue in April 2012, which you can read here. Only an estimated 1,850 remain in the world, just slightly more than the number of endangered pandas. Most of these reside further north in the Canadian Rockies, but a small subset — the Southern Selkirk herd — dwells in this border country. While estimates vary, the herd is thought to number about 40. Few people are familiar with the caribou. Fewer still have seen one. But this creature has sparked lawsuits and court-ordered land closures. Now, a controversial federal plan to help save the species is provoking fears of economic decline, cries of “social engineering” and efforts to remove it from the Endangered Species List. At the center of the debate is math: How do you calculate the value of an entire species? This week's Fish and Wildlife decision finds that the caribou should not be de-listed but would make some changes to how they are listed. The protected caribou population would still include the previously protected herd that moves between Idaho, Washington and British Columbia, but would now add additional British Columbia caribou. That would expand the size of the group, so the agency would consider it threatened instead of endangered. Still, the decision wouldn't change the agency's recommendation that 30,000 acres be set aside as "critical habitat" for the caribou. Read the full finding and submit comments here.